You know that saying "Safety first?" Well, it's uber important for an athlete...especially when out on the open road. Since we aren't in that age where our medical info or identification is embedded in a microchip under our skin yet (I think? ), the next best thing is to wear an ID of some sort. A Road ID in particular. Goober's is pink, mine's purple. Awwww. I've had my Wrist ID Elite Road ID for some time now, prior to being contacted by OutsidePR for a review. But when I was asked to test Road ID out for real, I jumped at the chance: Goober goes running with me now, and she needed her own ID just in case. I designed a Wrist ID Sport in girly pink for Miss Goober, and also ordered a bright blue Firefly for my night runs. Sorry flashing blue Aetna light...I just don't like chasing you down the street. "Don't go into the light, Carolann!" The blue Firefly is pretty awesome. It either blinks or is a constant LED light for all your night running safety needs. 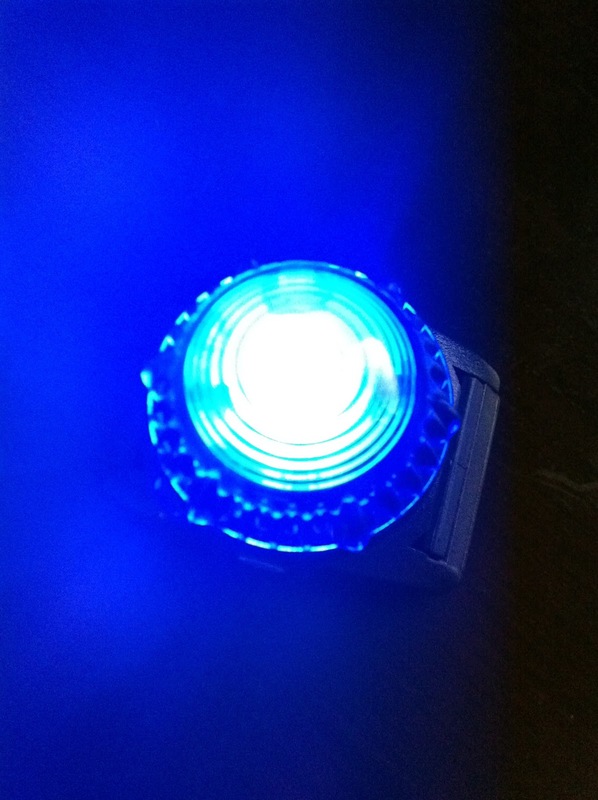 I clip this bad boy on the back of my running hat and it stays put (unlike some other blue flashing lights that shall remain anonymous...). My only gripe would be that turning the light on and off by twisting the top kind of hurts. I always have to use my shirt as a buffer. Owie. I want you to be safe out there!! And now for the giveaway! One lucky winner will receive a $35 gift code for a Road ID. "Stay safe out there! Your chance to win a @RoadID is with @RunZoeRun http://bit.ly/g7dnSG"
Hey Zoe! Great post and giveaway - I love it. I don't have a RoadID now, but if I did I'd get the Wrist ID Elite (original). Definitely would allow my fam to worry a bit less when I'm out running the long runs. I would get 1 shoe ID to replace my old one that I can no longer find (and I have new contact info) and 1 for my boyfriend who it getting into running more. I love the elite Sport, and they have a skinnier one that I saw in a brochure that's not on the website yet! I have a roadId but need a replacement ID as me and the hubs contact info changed. I totally need a replacement... all the info is wrong! I would be in big trouble! Posted in the sidebar on my blog. I've linked you through my NofSahm Facebook Page. I want an orange elite road id. My purple one is in rough shape. I like RoadID on FB! I follow RoadID on twitter! I Liked Road ID on Facebook! I Liked RzR on Facebook! I currently have a RoadID but my contact info has changed so I'd love a new one or one of the Fireflys! I would get the ankle ID I think. The firefly looks pretty cool too, since I am now running at dark'o clock. I want to try the Firefly! I already have a pretty purple RoadID (LOVE IT and think every runner should have one). I would order Dean!!! Next choice- purple road ID elite. I liked Road ID on FB. I liked you on the Face! I would def. get the purple road ID- I have been dying to get one. I did a whole post on my blog about women jogging at night. Hi! I would get the wrist id elite in GREEN!!!! I "like" Roadid on fb & let them know you sent me over. I would buy the Wrist ID Sport - one in pink and one in black so I always had something to match whichever running outfit I was wearing! I liked Road ID on Facebook. I'm following Road ID on Twitter. I would get the Road ID interactive! I totally want one of those lights for running before dawn. I wouldn't mind a road id bracelet either! I posted this on the giveaway tab of my blog. awesome giveaway zoe! thanks for sharing!!! 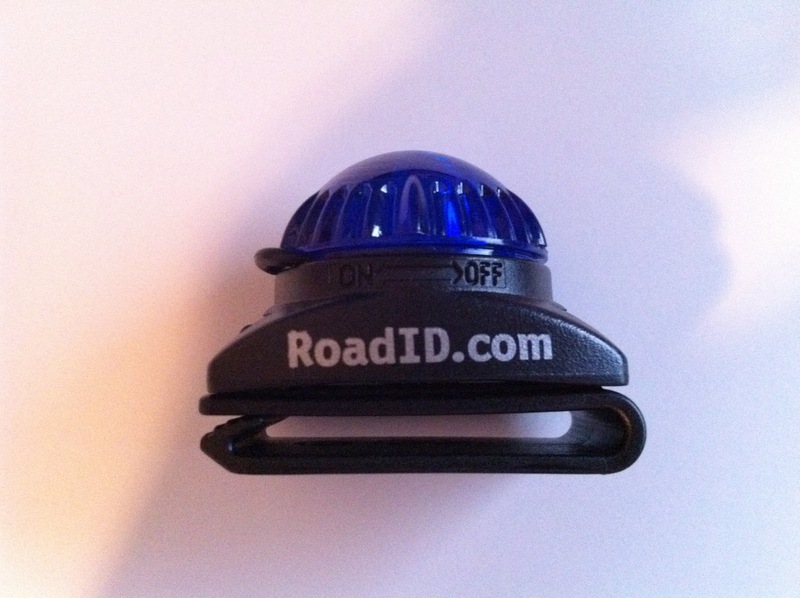 i have a road id, as does my husband, but i def want one of those lights as I ALWAYS wear my hat so it would get good use when i'm out walking, running or biking!!! i have no idea what google friend connect is but i follow you blog in my google reader! Already "Like" Road ID on Facebook. I already have a Road ID and bullied my husband until he bought one as well. I want to win this one for my sister. She will be moving to a new town all by herself to start her dietary internship and she needs something to keep her "safe" while she runs. 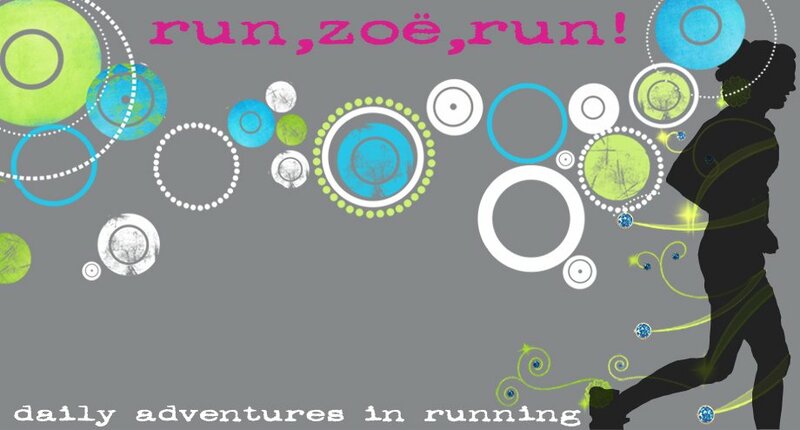 I Follow this blog :) Love my Zoe.. Run this weekend?? I would get a red ShoeID. Ive been DYING for a road id and will use some birthday money to buy one if i dont win! i want the bracelet like yours!!! and i like road id on facebook too! I would get the Wrist elite. I now follow you using GFC. I already follow you on google connect. I went to the road ID's website and I would get the original wrist ID. I don't have one, and would LOVE to have one since I run alone most of the time. I am also a beginner runner, so this would be awesome to have in building up my "gear!" I linked You on Facebook. I linked you on my blog http://kimsgonerunning.blogspot.com. I'd get the shoe pouch ID for my sister--I already have (and LOVE) that myself and am SO glad for the feeling of security it gives. I would love the new Road Id Elite. I tweeted with your button! I would love the Pink Elite. I should say I would LOVE it. I would for sure love the wrist ID I need to get one. Great giveaway. Currently, I run without i.d. I would love to get the shoe i.d. since I would have no excuse about forgetting to bring it with me. I would get the Shoe ID, maybe a wrist one too! I would get the ankle ID and a Firefly Supernova. Gotta stay visible! I already own a ShoeID, but would love to have another one so I can easily switch shoes (without having to move my current ID to the other pair).